After much thought I decided to mount my Ram Ball on the left fairing cover. It’s positioned perfectly for my camera to peer out between the mirror and windscreen, and the second ball will hold my phone/GPS. Because of the slight curvature of the cover, I needed to fill the gap between it and the mount base. I chose a 1/8” thick foam rubber harvested from a flag from Hobby Lobby for $1.29, should be able to handle moisture just fine and was easy to cut. I cut the circle just a bit smaller than the diameter of the mount base, thought it would look better that way. I also put a little Loctite on each of the nuts to counter any vibrations. The one downside to placing it here: restricted access to that bolt in the cover (you can just see it in the pic beyond the second ball, as well as the close-up side shot). I had to use the short end of a hex wrench instead of my powered screwdriver, took a few minutes to do a half turn each time. But, it’s right where I wanted my GoPro and GPS to be, so the positives outweigh the negative. Definitely unique and interesting! Will it have a clear view if hand deflectors are installed there? I know some folks used the Ram mounts for hand deflectors instead in that same area. 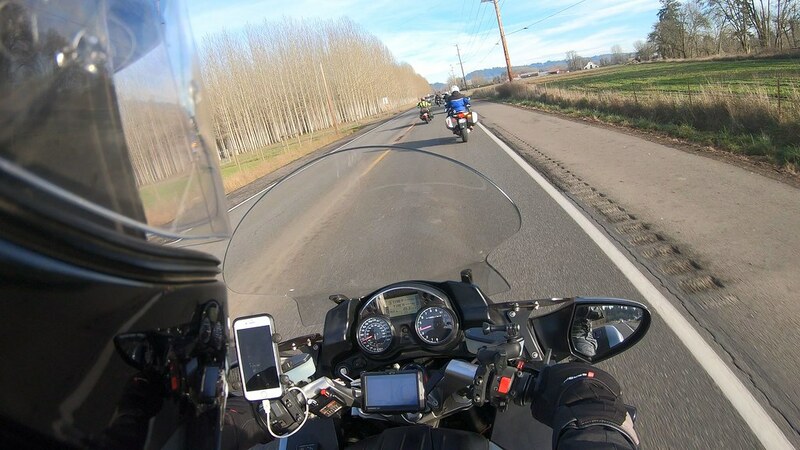 I have the GoPro mount installed on the right brake reservoir mount and you're right, the view was obstructed by the windshield depending how much I raised it. I'm now testing the mount on my helmet and you can see the old location near my right hand.